China grass well known as agar agar is a type of gelatin extracted from Sea weed. It is called as “Kadal paasi” in Tamil.It is available in the form of strands and powder.It is mainly used for making jellies,puddings and custard all over Asia.Once Sendhil told me about china grass halwa he tasted in his office.He told its very good for health and the best body coolant in summer.So I too wanted to try halwa with it and bought a packet of Bakers china grass. At that time I was not aware of other china grass recipes like china grass pudding and china grass payasam/kheer.When I was browsing for some simple agar agar recipes, I got it here. Its an easy dessert recipe with agar agar and milk. I made it in two flavours.One by adding rose milk essence and other one adding vanilla essence. Raksha loved the white one. Myself and sendhil liked the pink pudding.Soon I must try varieties of this pudding using tender coconut water, mango and pineapple. Its a quick fix and healthy, Indian dessert recipe. Do try it for your kids and yourself. You will love it ! 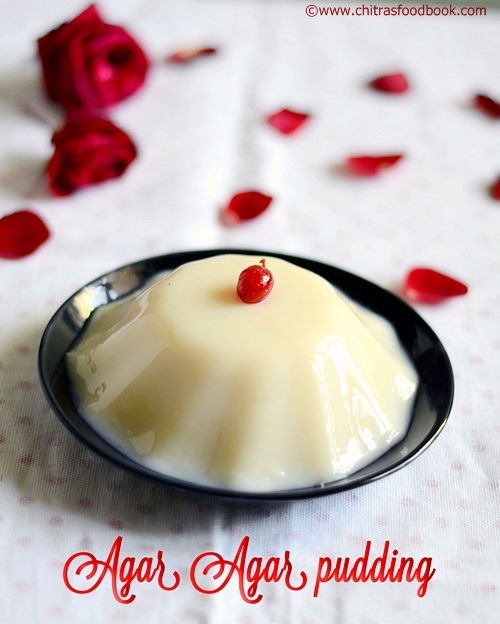 Easy,yummy,healthy pudding recipe using China grass/Agar agar. In a wide bowl, take 1 cup of water. If you want thick pudding, use 3/4 cup water. Cut the china grass into pieces and let it soak for 15 to 20 minutes. You can add it whole as shown in the video. China grass will become soft. In the mean time, boil milk for a minute. Do not add sugar now. Switch off the flame and keep the boiled milk aside. Take the soaked china grass along with water and boil in medium flame. Keep stirring. China grass will melt and mixes with water. When its 90% dissolved, reduce the flame to very low and keep stirring. It will dissolve completely. If you mix in high flame, china grass will thicken. So do it in low flame and make sure agar agar mixture is in liquid form. Now add this china grass water to the milk. No need to strain it. Mix well. Milk won't become thick now. It would be almost in same consistency. Now add sugar, mix well in very low flame till sugar dissolves in milk. You could find small crystals of china grass as you cook. Don't worry. Remove from the flame and let the milk become warm. Then divide the milk in two different shaped bowls. Add vanilla essence to one bowl and rose milk mix essence to the other. Mix well. Let the milk cool down. It will set once it starts to cool down. Refrigerate for 3 to 4 hours or till its set. It would be well set. Remove and invert in a bowl or plate. Serve immediately. In the original recipe, it was mentioned to use cardamom powder.But I used vanilla essence. U can also add few tbsp of condensed milk for more thick and rich taste.In that case, you should reduce sugar accordingly. Do not cook the milk+ agar agar for long time after adding sugar. It may curdle. Love the shapes....... Looks yummy and glazing ! Great looking pudding, looks inviting! Delicious pudding and very tempting clicks..
oh ..just quick ..yummy puddings . Pudding Looks so yum!!! Just mouthwatering clicks!! I have a been silent reader of your blog for sometime and love the way you present each recipe. Happy to follow you sis... Would be glad if you could drop in my blog at your leisure! Pudding looks so colourful and perfect.great presentation!!!!! Wow..Superb Chitra. China grass is lying in my pantry since long time. Will try this weekend. Liked the simplicity..
Hi chitra, tried it yesterday. It was very good. Pl clarify my doubt, when i added teh china grass mix to the milk, the milk became watery and i kept it in the stove for more 10 min. The pudding was thick. Hi Chitra, am a regular visitor of ur blog and loved all ur recipes.. I tried many of them and came out super.. Thanks for ur wonderful recipes dear.. I have small doubt regarding homepage..In ur site the posts are in order and for every post beside the image ur description was there.. But in my blog under the image description is coming..So I wanted me to change in ur mode.. Will u please tell me how to change that? wow! super.. My daughter loves this. As soon as it is made she starts tasting it even before it gets set.. Nice presentation Chitra..
but this very soft i take piece in hand its break. how to i hard some. Next time try adding less water or milk.You can make pieces. Hi,please use 1 tsp of powder for the given quantity.i think it will work.Iam not sure. Hi,I am not sure about using gelatin or powder.Sorry. I am not sure whether it will dissolve now. It melts in heat well. Better stir in heat till it melts and then set it. Thanks. Today I prepared China grass pudding...But wen I added the chinagrass water to the milk+sugar vessel the milk got curdled...Wats the reason . Hi, Sorry for your experience. I think the problem is with milk or the quality of china grass. China grass was manufactured in aug 16...But expiry date was after 3yrs. Hi Soniya, Then I think its because of cooking agar agar in milk for long time. I will try to make a video recipe soon so that it will be easy to understand. I'm going to make 3 times the recipe for a big dish. Thank you so much for your feedback. It made my day.